Join us on the trail: East Lake Samm Trail, Issaquah segment grand re-opening tomorrow! We here at King County Parks are delighted to announce the grand re-opening of the Issaquah segment of East Lake Sammamish Trail. Join us on the trail this Wednesday to celebrate! The second portion of the 11-mile-long trail to be developed, the Issauqah segment paved approximately 2.2 miles of 12-foot wide trail with gravel shoulders, making the trail more accessble to visitors of all ages and abilities. We also installed concrete sidewalk connections and improved traffic controls and crossing treatments, as well as enhancing native landscaping and improving drainage. 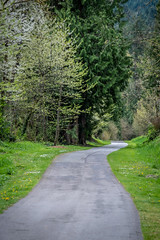 A former railroad bed, the East Lake Sammamish Trail is the missing link in a 44-mile corridor that stretches from Puget Sound in Seattle to the Cascade Foothills near North Bend. Remaining segments of trail through Sammamish are in design and permitting and will be constructed as funding becomes available. Learn more about the Master Planned Trail and development work on the ELST construction page. Development of the Issaquah segment of the East Lake Sammamish Trail was made possible with funding from the voter-approved 2008-2013 Open Space and Trails Levy, the state Washington Wildlife and Recreation Program, and the federal Congestion Mitigation and Air Quality Program.